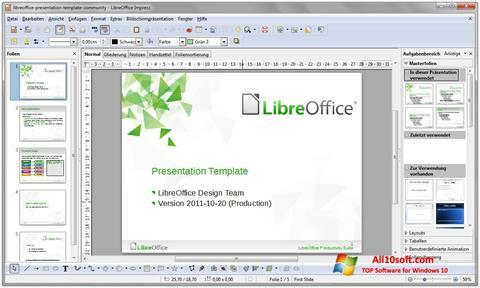 LibreOffice for Windows 10 - Office suite of applications based on open source. The complex contains an environment for writing texts with html syntax support, a spreadsheet editor, including a formula editor and dependency plotting tools, a module for vector design, a tool for creating presentations and database management. A set of utilities supports complex mathematical calculations, uses a package of symbols and specialized characters. The software applies its own format of saving documents, can open and edit files of third-party office applications. You can free download LibreOffice official latest version for Windows 10 in English.